One of the largest ski areas in the United States and one of the few North American ski areas with more than a 1,000m vertical. Heavenly is now owned by Vail Resorts and has base areas in Nevada and California. There are spectacular views over Lake Tahoe and great nightlife and resort facilities along the south side of the Lake. When will it snow in Heavenly? 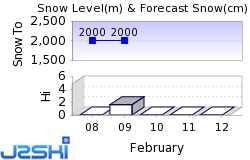 The next notable snow forecast for Heavenly is 1cm-, expected on 1 May. The American Ski Resort of Heavenly has direct access to 85 marked pistes, served by a total of 27 ski lifts. The ski resort itself is at 2,000m6,562ft, so skiing or boarding back to the resort is usually possible. With ski lifts as high as 3,060m10,039ft, skiing and snowboarding is assured throughout the season. Heavenly is unique. For those of us that collect facts and figures about ski resorts it's unique because it exists in two US States, with just over half of its lifts in California, the remainder in Nevada. It can also claim to have the biggest vertical on the western coast of the United States, the biggest ski area in California (and the second biggest in North America) and the highest skiing in the famous Tahoe region. More important than the numbers though is the stunning scenery as you look down on Lake Tahoe, North America's largest alpine lake, and for many visitors the availability of Tahoe's legendary '24 hour nightlife' once they're off the slopes. It was the view, and the 'heavenly relief' of the warm air rising, that lead settlers in the 1800s (arriving in the area from the backside of Heavenly rather than the Tahoe side), to give the area its name. A century later, the name 'Heavenly ' fortunately turned out to be a marketing man's dream. Of course, this being a huge ski area, there is terrain to suit everyone, with sharp chutes on one side and long wide open cruisers on another. Snow is another asset for which Heavenly is famous, its average annual dump of nearly 30 feet (around 9 metres) is of course vast, but 70% of the trails have snowmaking cover, one of North America's largest machine-made blizzards, giving top-to-bottom coverage on both Nevada and California sides. Natural snow has been known to fall on the high Sierra where Heavenly sits during every month of the year. Heavenly has been around for 50 years now and has gone through various metamorphises during that time. There were skiers here longer ago than in most places, most notably the famous Snowshoe Thompson who crossed over the area where Heavenly now stands when carrying the mail by ski in the mid-nineteenth century. Heavenly's current owner is Vail Resorts, the group's first full resort purchase outside of Colorado. The company bought Heavenly during a period of major improvement both on the mountain and around the South Lake Tahoe area at its base. The biggest improvement for the ski area is the new Village at Heavenly with the Heavenly Gondola as it's centrepiece. Two new Marriot properties sandwich the Gondola base lodge and the Village also included a Cinema, Ice Skating Rink anda multitude of shops, reastaurants and bars. Heavenly's huge ski area takes in a vast array of terrain offering the ubiquitous something for everyone. Beginners have gentle terrain near the base lodges and friendly Californian tuition to look forward to. The resort has recently upgraded its beginner programs in a bid to get way above the national average in North America where apparently only 12% of first timers get hooked and stick with the sport. The new approach includes shorter lighter beginner-friendly skis from Rossignol and a specially tailored package dubbed 'Learn To Ski - Easy as 1-2-3' which includes rentals, tuition and beginners' lift tickets. Intermediates have the most to benefit from a visit to Heavenly, where they'll find they're able to tackle most of the terrain. Anyone interested in purchasing new gear, or just keeping up to date with what's on offer in the rapidly changing ski hardware market, can join in a free 90 minute Guided Demo. Groups of up to six can demo new gear in the company of a guide who will try to ascertain exactly what you want from your skiing, suggest gear to match your ideals, and then let you try it out. The scheme has been so successful that there are now Guided Demo centres on both sides of the mountain. Advanced to expert level skiers will find just over a third of Heavenly's terrain classified for them, with famous runs like Gunbarrel, on the Californian side, is ideal for those confident enough to do some posing under the chairlift. Otherwise the Milky Way Bowl and Killebrew Canyon over on the Nevada side should provide plenty of entertainment. Heavenly is one of the world's leading destinations for snowboarders, with an ever growing percentage of the resort's clientele preferring to ride rather than ski - a much higher proportion than at most other major resorts. Half of all North American riders currently take their main vacations in West Coast resorts. One of the first of the Tahoe centres to welcome 'boarders (in 1988), Heavenly has continued to invest in snowboard-oriented attractions, activities and events. The resort owns two snowboard-only retail outlets in South Lake Tahoe. The terrain parks are spread throughout the mountain and a pipe dragon is employed to maintain the pipes. A range of events and contests are staged throughout the season to help underline Heavenly's position as a 'boarders mecca. They include half pipe competitions and boardercross. Around 70% of Heavenly's terrain is groomed nightly, making it a carver's paradise and the resort has added a Bombadiere halfpipe grinder to its already impressive grooming fleet. We don't currently have confirmed season dates for Heavenly. Usual opening is late November, and usual closing is Mid April. NOTE:- Lift and Piste openings are always subject to Snow Conditions in Heavenly. Heavenly is able to make snow, with 200 snow cannons. The 27 ski lifts of Heavenly are able to uplift 52,000 skiers and snowboarders every hour. Heavenly is in Orange, California, United States. The nearest airports to Heavenly are Reno Tahoe and Sacramento, all within three hours drive. South Lake Tahoe, where Heavenly is located, is an area choc-full of bars, restaurants and night spots, over 150 in total! Popular choices include The Pub Tahoe, Turo Pub, Mulligans and the Blue Angel Cafe. Nightclubs include Altitude in Harrahs. Plenty of unique watering holes, including Nevada's oldest bar and saloon in the State's first settlement, Genoa, located close to the resort's Nevada base. It's a rare experience to find anything indigenous but not native that's nearly 200 years old in Western North America and well worth the visit if you have a car. As is Virginia City, 40 miles away, a well preserved former mining town. The casinos provide their own unique form of entertainment with 24/7 gambling - and, of course, free drinks for anybody playing. Other popular Ski Areas near Heavenly. Want to ask about skiing and snowboarding in Heavenly? Or contact Heavenly Tourist Office. Note :- The information on J2Ski concerning Heavenly, where not clearly factual, is opinion only and is neither definitive or exhaustive.